RYAN worked the Woods Point stretch with live fish baits for one 2kg and one 2.5kg mangrove jack. THE Noosa river has continued to fire with great captures coming from both ends of the estuarine system. Upstream the snags and logs up between the lakes continue to produce quality catches of mangrove jack and trevally by trolling lures such as the River 2 Sea Suspen Minnow. It has been noted that the only hook ups have come when the lures are bouncing off the bottom. The jew hole, just before the first lake, has also been producing some exceptional mangrove jack fishing at night. 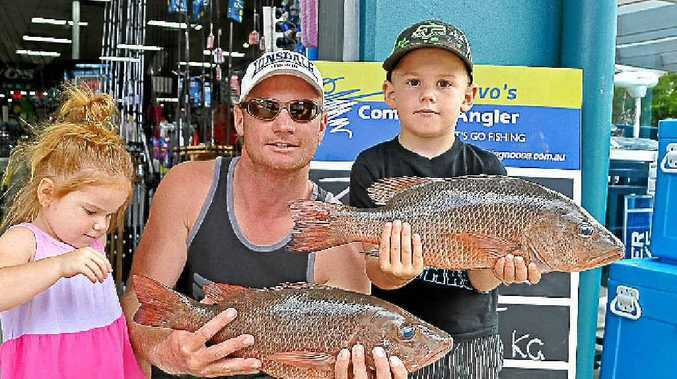 Down lower, along the Gympie Tce stretch, anglers have bee picking up some great feeds of whiting and flathead, along the sand flats behind the boat hires on live worms and fresh mullet. Flathead have also been frequent in the Frying Pan area, taking slow worked River 2 Sea Flexi Babes and Squidgy Fish. The river mouth is the place for bream at the moment, along with the Noosa Sound circuit, on frozen prawn baits and Berkley Gulp 2inch Shrimp. Woods Bay and Sheraton Bridge have been hot spots for trevally and tailor, while Munna Point has been a little slower. The sandy shorelines along the North Shore stretch have been fishing surprisingly well, with more unexpected flathead being included in the mix. The tailor continue to chomp their way through the gutters at low light periods while the whiting scavenge the closer inshore gutters. Perigian has been lucky enough to be producing some of the best looking gutters at the moment, which are holding plenty of dart, whiting and tailor during the late afternoon run-in tides. There are rumours of spottie and spanish mackerel floating around Laguana Bay. For information visit www.fishingnoosa.com.au or come in and talk to the team at Davo's Compleat Angler.